DePaul’ Universitys Mike Miller (right), associate professor of economics, and Tom Mondschean, professor of economics, discuss current issues facing the economy. 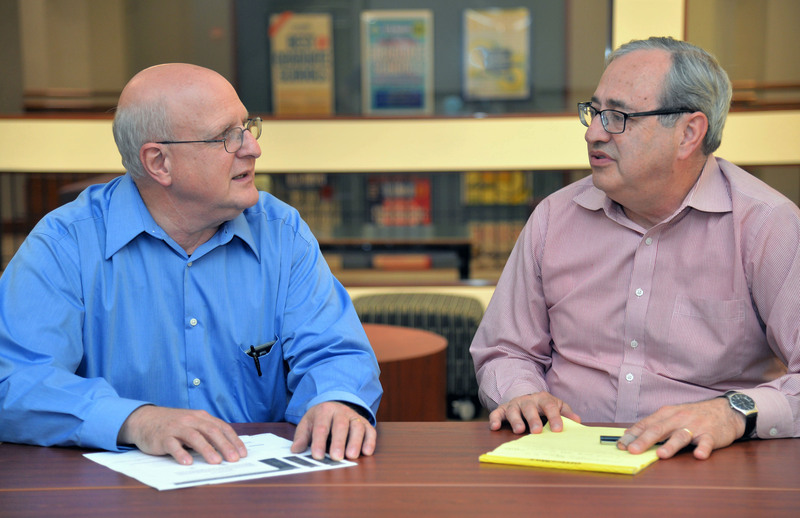 Mike Miller and Tom Mondschean are two long-time DePaul economics professors who are often interviewed by the media about current economic debates. Last fall, they teamed up to share their varying perspectives on economic issues shaping the 2016 Presidential Election as guest lecturers in a DePaul political science class. 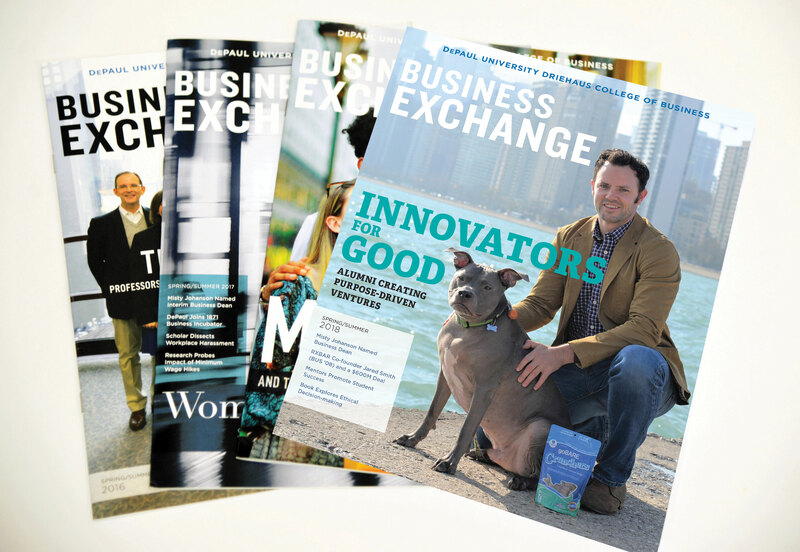 Business Exchange checked in with them again this fall to find out their views on five big economic questions that are dominating current national and local headlines. 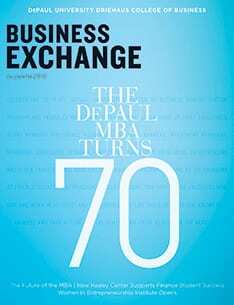 The questions include two submitted by alumni via the DePaul business school’s LinkedIn page. Below is an excerpt of this conversation. Q: Do tax breaks stimulate growth in the economy? Mondschean: Tax breaks can be an effective stimulus depending on the type of tax break. But I don’t think generally cutting taxes across the board necessarily stimulates the economy any more than any other kind of fiscal stimulus. For Instance, tax breaks to encourage more investment or research and development would be more useful than other types of tax breaks. Miller: I agree, but would add a few other things. Many people on my political side think that all tax breaks always lead to growth. They point to two other cases (of leaders who implemented tax breaks): John F. Kennedy and Ronald Reagan. What they are missing is that the rates that were changed (then) were excessively high and they were dramatic reductions. However, if you are talking about reducing taxes, which are already low, there is not any empirical evidence that this will lead to higher employment or higher incomes and so forth. Mondschean: You also have to consider the offsetting factor of the deficit and how often people tie high tax cuts with government spending cuts to make the revenue deficit neutral. Miller: There is research that asks the question: can you starve the government in order to cut taxes, and the answer is no. Cutting spending is not the number one way to get things to work. The most contractionary action a government can take is to raise taxes. The effect of a tax hike is much greater than a commensurate decrease in government spending. Mondschean: It is not asymmetric in that way. Tax increases could potentially be beneficial if they cut the deficit. We already under fund our government given the amount of spending the people want to have and we push that responsibility onto future generations. The true level of taxation on the economy is the level of spending, not the level of taxes. Shifting the cost onto future generations by not taxing enough to pay for the spending is what we are doing and it is harmful. Miller: According to the works of economic researchers David and Christina Romer, the most contractionary action you can take is increasing taxes, not cutting spending. Tom and I mostly agree that raising taxes can be bad. Overall, we agree, but you can actually make things better if you fund the government properly. Q: How does Illinois’ pension crisis affect Chicago? Mondschean: In some ways, it has not affected our city yet. The economy keeps chugging along. Illinois has been a cheaper place in which to do business in the last few years in part because it has not adequately funded its pension plan. I don’t think people fully understand the magnitude of the crisis that we’re facing. As of Dec. 31, 2016, the Chicago firefighters’ pension fund is about 21 percent funded; the police fund is just under 30 percent, and those are based on fairly generous actuarial assumptions about the underlying liabilities. Those funds will eventually run out. And what happens when they do? What do we tell the firefighters and police who have put their lives on the line for their whole careers to help the city when their pension funds run out? This is a crisis Chicago will face 15 to 25 years down the road. It is hanging over our heads and no one has a real sense of the issue. Chicago’s mayor raised taxes quite a bit to put money into the pension fund, but that was a small portion of what is needed. This has been a problem that will have an effect on the business climate in the long term. Miller: I have nothing to disagree about this, but I would add that the only way around it—given that you can’t change the agreements—is to raise taxes. You have to fund it properly. When you compare our relative tax rates to others states around us, it’s clear that raising our taxes again can only be extremely damaging. When you combine income taxes with real estate taxes and sales taxes, we have a relatively high tax rate. The trouble is Chicago is so close to the border. If it were in the middle of the state, it wouldn’t be the same situation. All the surrounding states have a better business atmosphere than we do, which allows capital to move not that far and keep their customers. The pensions have to be funded. It will be immoral to not pay these people their pensions that they have been promised. They’ve made their plans for retirement with these pensions in mind. But, how do we pay for them? We make assumptions that these funds will have a 7 percent rate of return—but the state hasn’t made their contributions. That is why our credit rating is the second lowest in the country—if not the lowest. Anything that you borrow, you are going to have to borrow at a higher rate. Mondschean: This definitely affects the finances of the state and local government. Illinois is in a mess not only because of pensions, but also because we have huge backlog of unpaid bills. Mondschean: That’s a huge problem and the lack of any kind of consensus in Springfield to come to terms with this in a meaningful way is troubling. Chicago is a net revenue producer. We send more revenue to Springfield than we receive. This unfairness has never been addressed. Miller: No, globalization helps, but it helps unevenly. There are going to be winners and losers. Some of my conservative colleagues and I split in this opinion. Some people are ruined by globalization. It is my opinion that if the government is going to impose such policies, it behooves them to then help these people be retrained to get into something else given what their policy has done. Are we better off getting the product with the lowest possible price, with the most efficient allocation of the world’s resources? But there are people who are clearly ruined by it and they have to be helped and given a chance? Mondschean: I basically agree. But I’m not sure that retraining will be the panacea to help these people. It is a hard issue. I think if resources could be more efficiently allocated and it would strengthen the economy, but it requires new entrepreneurial activity to use the resources released by globalization. Companies can become more productive through globalization and then those companies become more efficient. Producing more goods and services with the same resources is how the economy and standard of living improve. We have not been doing a good job of improving entrepreneurial activity. That is one of the big issues facing the economy today: how can we increase the level of entrepreneurial activity especially in the poorer areas in the city? Miller: The number one creator of new jobs is startups. The entrepreneurial activity in the country has started to fall before the recent recession and it has not recovered. People are becoming more risk averse. Something is not clicking in the entrepreneurship sector. Mondschean: This is a complicated issue. I think that there have been changes in the way corporations are governed, which have changed the relationships between labor and capital. This has, in effect, reduced the bargaining power of labor. Most people get cost of living increases, but do not receive the benefits of productivity growth. Since the end of World War II until 1990, real wages and productivity have roughly followed the same upward trajectory. But since 1990, productivity has been rising and real wages have not. What I believe happened is that corporations became so fixated on raising their share price at the expense of everything else, that this has led to a transferring of value from certain stakeholders, like employees, to shareholders. We need to reward true value creation as opposed to value transfer or diversion. Value diversion should not be supported by government policy, but value creation should be. How to distinguish between those two is really hard. Miller: The one thing I would add to that is that there seems to be a belief within corporate world that the returns you get on investing in new capital simply do not justify buying the new capital. If you have all this money, it can just sit there or you can use it to manipulate your stock prices. It could be that they have nowhere else to spend their money. The issue is that wages paid to workers are not keeping up with worker productivity. And we, as economists, teach that in an economy that is functioning properly, workers should be paid in relation to their productivity. The more you produce per hour worked, all else constant, the more you should be paid per hour. In no other expansion between the end of a recession and the beginning of the next recession has income not risen above where it was before. And we are in that situation today. Mondschean: I think there is another simple explanation for this. The vast majority of CEO compensation is tied to the stock price. Miller: Why did Mr. Trump win? Wages have not gone up. It becomes frustrating as a worker. What allows you to move up if you are born into the middle class? It’s harder and harder to move up. Those who do essentially take risks. Mondschean: This is the age of shareholder capitalism in the U.S.